BIG Shopbop Sale – You Can’t Miss This One!! You know how much we love our Shopbop sales around here! Well, now it’s time to celebrate the end of the holiday shopping with a sale you will not want to miss! You just dream the item looking for to spruce up your closet and they have got it and so much more! 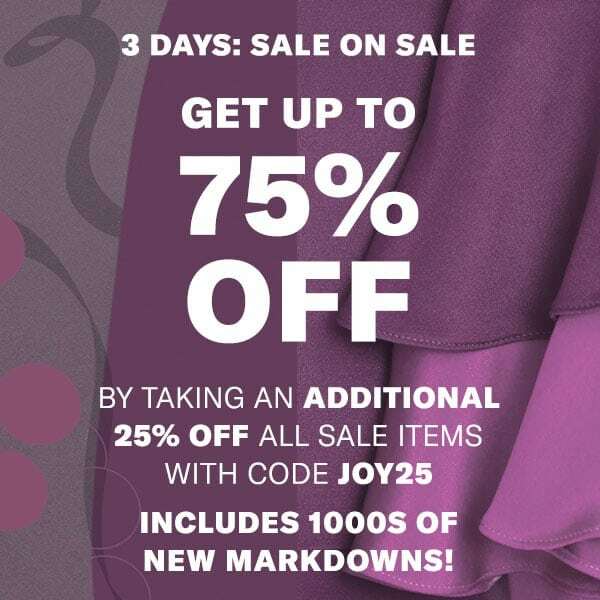 Plus right now they are having a BIG 3-day sale where you can get up to 75% off by taking an ADDITIONAL 25% OFF all sale items when you use code JOY25 at checkout. This includes thousands of new markdowns! Need to plan ahead for Valentine’s Day? They got it! This sale starts today (Tuesday, December 26) and runs through Thursday, December 28 at 11:59 pm PT. Please note that some brands are excluded. Head to Shopbop and use the code JOY25 to save big! This entry was posted in Deals, Fashion on December 26, 2017 by Chrysa.